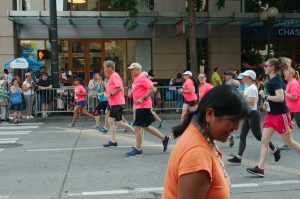 Saturday, July 28th was a scorcher, especially at 5 pm when thousands of walkers and runners gathered at Westlake Park for the annual SeaFair Torchlight Run. In this crowd were three runners. 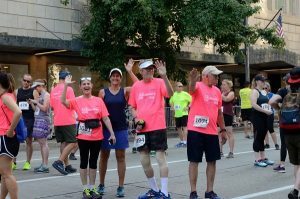 These runners are Members of Recovery Café’s Sole Train walking and running club, and were representing Recovery Café at Seafair for the fifth year. This year, our Members selected to run the 8k portion of the race, instead of the usual 5k walk in years past. For 2 of our Members, this was their first 8k event. Not only was running in this event a great physical milestone for these Members, it also gave them a huge sense of accomplishment. Recovery Café aims to support the mental, emotional, spiritual, and physical health of all who walk through our doors. Sole Train runners participating in this year’s Torchlight Run had to set a goal (running the 8k instead of 5k), take the steps to reach the goal (training runs every Wednesday and Saturday), and then finally meeting the goal. Sole Train provided each of these members a sense of team spirit and camaraderie in getting everyone across the finish line. 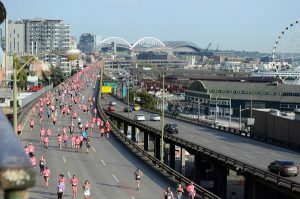 Although this is the last year running across on the Viaduct, Sole Train runners are prepared for whatever course stands in their way in the years to come.